Why the feet? Because your bulldog’s paws do a lot of important work! Not only do they walk your bully everywhere, but the pads of his feet also help cushion his bones and joints when he walks. And that’s not their only job! 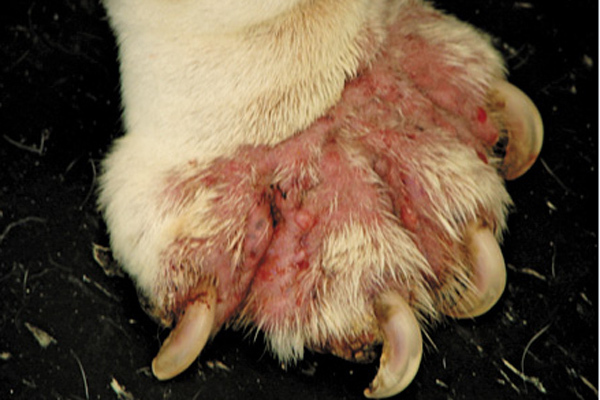 Your bully’s paws protect the tender tissue of his feet against rough walking surfaces and extreme surface temperatures. Good detective work is the first step toward taking care of your bully’s feet. You should regularly patrol your floors and yard for anything sharp or pointy that could cause a cut or a foot injury. Here’s the rule of thumb: if you don’t want to walk on something barefoot, then neither does your bully! 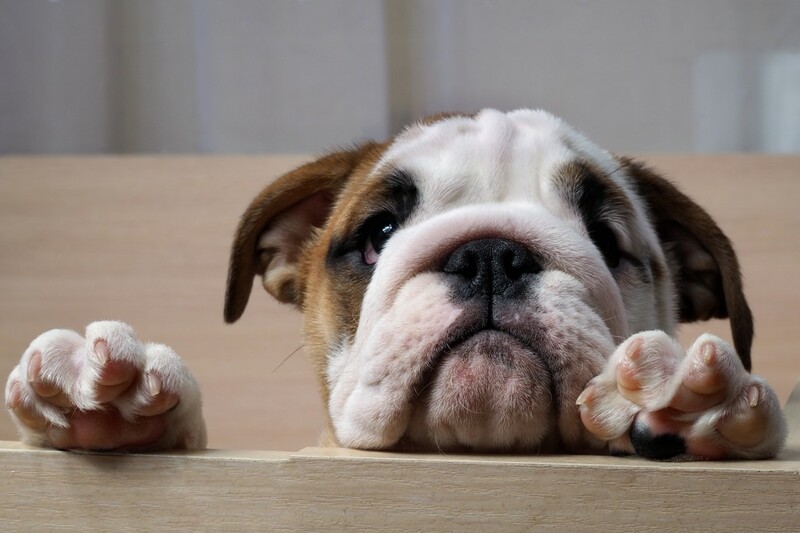 You should also monitor your bulldog’s pads during a strenuous walk or hike; make sure the bottoms of his feet are not becoming raw or irritated. If your bulldog cuts his foot, then you should administer first aid. For small foot wounds, washing the cut with antibacterial soap and protecting the injury with a bootie will be sufficient. If the foot wound is deeper than one-half inch, you should consult your vet for advice regarding treatment. Give Your Pooch a Pedicure! You always want to keep your bully’s nails trimmed so that they don’t quite touch the ground when he walks. Every dog is different, and your bully’s nail cutting schedule will depend on his activity level and nail strength. If you can hear your bully’s nails click on the floor when he walks, it’s time for a trim. Some dogs misbehave during nail trimming, and some dog owners are nervous about the task. If you are worried that you might accidentally hurt your bully by cutting his nails too short, your dog groomer or vet can trim your bully’s nails for you. Regularly checking between your bully’s toes should also be part of your dog foot care routine. Tweezers are good for removing foreign objects from between toes, and after cleaning, you should moisturize your bully’s pads to prevent them from becoming dry and cracked. Be sure to use a moisturizer that is specially made for dog paws as lotion for people can make your bully’s pads too soft to protect his feet. Protect Your Bully’s Feet from Extreme Weather! Walking on hot pavement or sand can quickly cause painful injuries to your bully’s feet. During the summer, you should always check surface temperatures with your hand, and don’t let your bully walk on anything that is hot to the touch. If your bully’s pads get burned, they will have blisters, loose flaps of skin, and/or red ulcers. 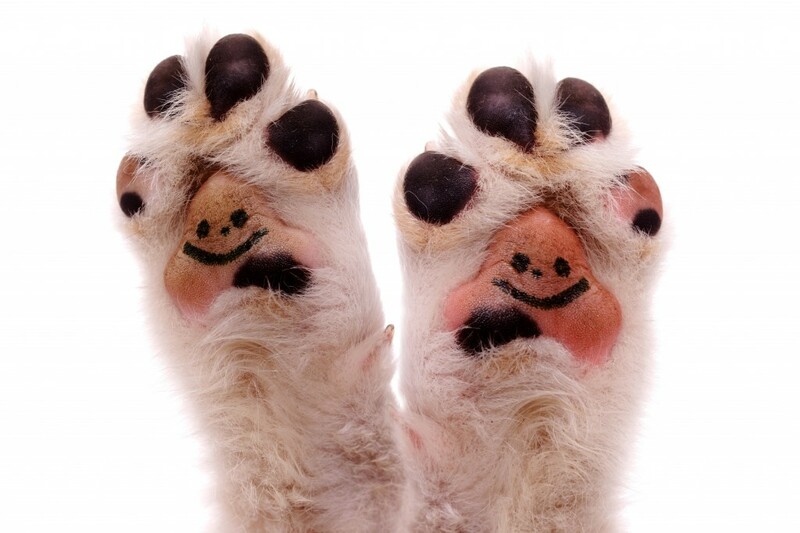 You can treat minor burns the same way you do minor cuts, but serious paw burns require immediate vet care. Extremely cold temperatures can be just as dangerous to your bully’s feet as extreme heat. 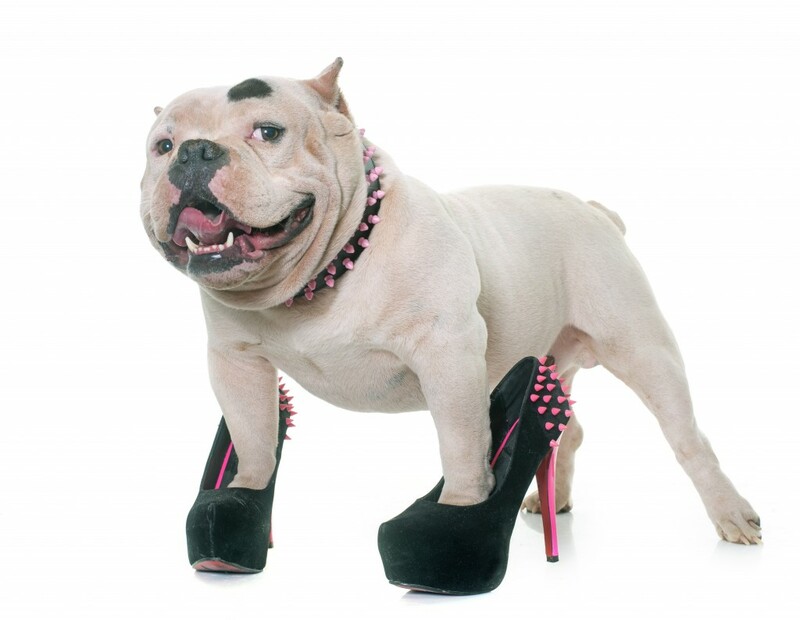 Repeatedly walking on extremely cold surfaces can cause your bully’s pads to become chapped and cracked. Chemicals such as rock salt are dangerous to your bully’s feet too; they can cause foot sores, infection, and blistering. The chemicals can also make your bully sick if he licks them off his feet. Dog booties are great for protecting your bulldog’s feet against cold surfaces and dangerous chemicals, and petroleum jelly is another way to protect the feet against rock salt. If your bully’s feet are exposed to salt or ice-melting chemicals during a winter walk, you should rinse his feet in warm water as soon as possible. You work hard to take good care of your bully’s skin, teeth, and nose; don’t forget about his feet! They carry the most precious cargo, and they deserve extra care and attention to keep your bully feeling comfortable. Pampered feet are happy feet, and your bully is worth it! 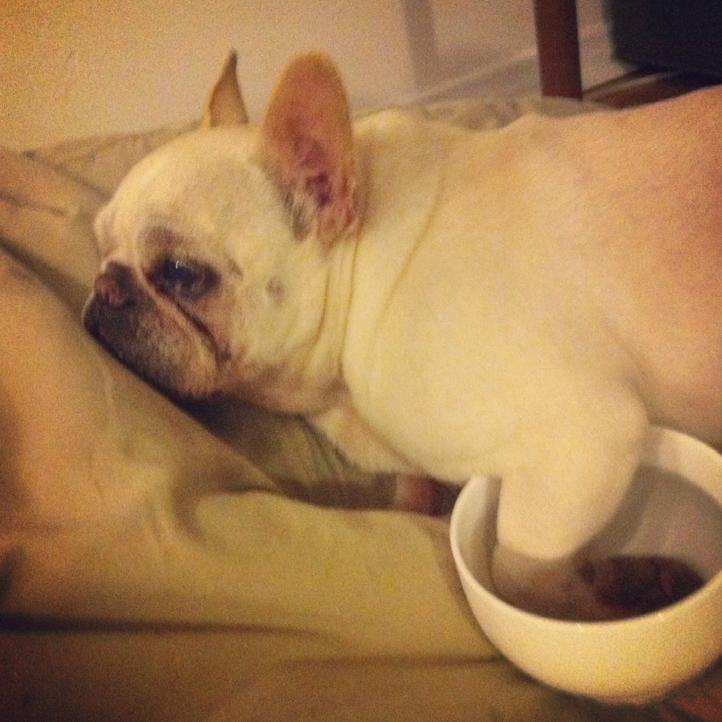 In this section, we will focus on two foot ailments that are common to bulldogs. What is Pododermatitis, and What Causes It? 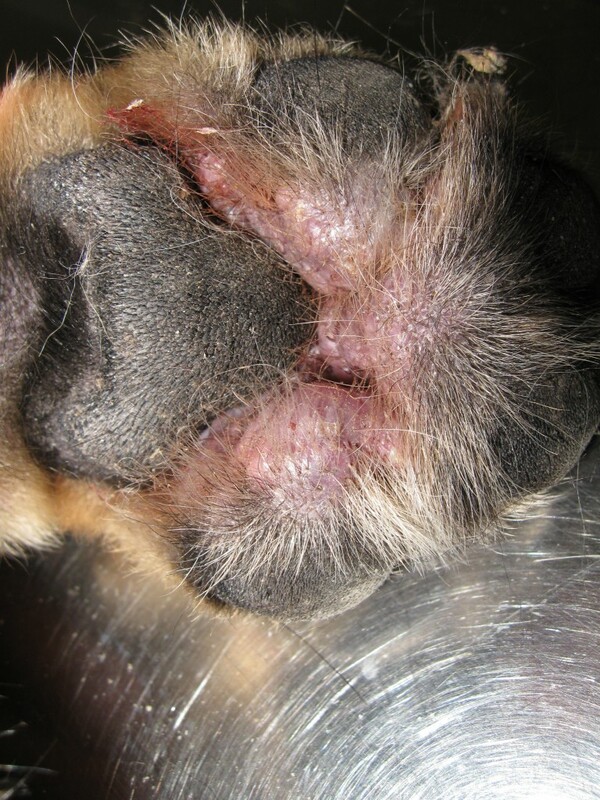 Pododermatitis is the term that vets use to describe inflammation of the feet or paws. It’s not a specific disease, but it’s a condition that can be caused by many other medical problems. What Are the Typical Symptoms of Pododermatitis? What Should You Expect at the Vet’s Office? If your bulldog has some of the symptoms of pododermatitis, you should take him to the vet to protect him from long-term foot damage. After an initial physical examination of your bully and his inflamed feet, your vet will perform 2 diagnostic tests. The first test will use skin scrapings to check for the presence of demodex mites that cause red mite mange. Additional samples will be taken to check for bacteria and yeast on the skin of the feet. Occasionally, an allergy work-up will be started if an allergy is suspected as the cause of pododermatitis. Rarely, biopsies, cultures, or exploratory surgery will be required to establish a diagnosis. Is There a Cure for Pododermatitis? Treatment and prognosis are determined according to which underlying condition is causing the pododermatitis, as well as whether or not there are any secondary infections. If a secondary bacterial infection is present, antibiotic therapy will be required for 4 to 12 weeks. 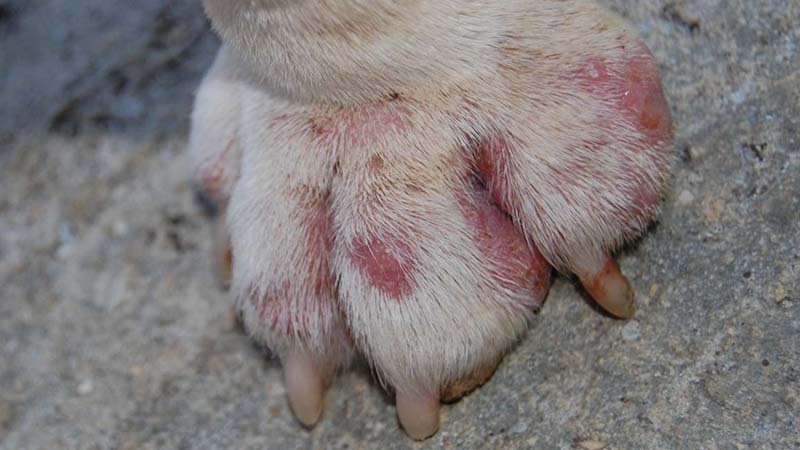 Secondary fungal infections require medication for at least 6 months, and sometimes removal of the affected toenails is the only option for completely ridding your dog of the fungus. Pododermatitis Sounds Awful! What Can I Do to Protect My Bully? Maintaining a foot care routine for your bully can help prevent some of the issues that lead to pododermatitis. Daily inspection and removal of any debris from between the toes is especially critical. Unfortunately, most of the contributing factors for pododermatitis are genetic in nature and caused by irresponsible breeding. Therefore, you may not be able to stop the onset of the condition in your bully. The best thing you can do to help your bully is to take him to the vet if he starts licking his feet excessively and has redness and swelling between his toes. With prompt medical attention, you can help prevent chronic, recurring pododermatitis in your bulldog. In this last section, we will discuss interdigital furunculosis, a condition that commonly affects English and French bulldogs. What is Interdigital Furunculosis, and What Causes It? Interdigital furunculosis is the technical name for inflammation between the toes. Most people use the term interdigital cyst, and English bulldogs and Frenchies tend to suffer from the problem more often than most breeds because they have short bristly hairs on the webbing between their toes. 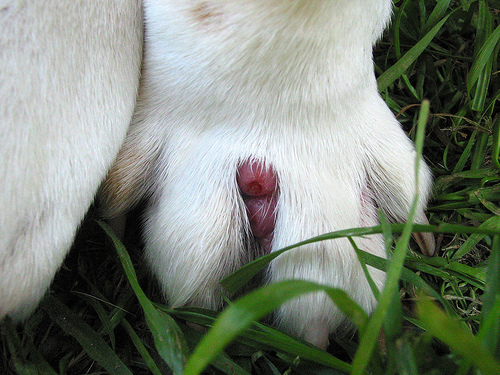 In addition, English bulldogs with splay feet, or spread out toes, are more likely to have interdigital furunculosis. Finally, obese dogs and dogs with allergies have a higher risk for developing interdigital cysts. Interdigital furunculosis starts when short shafts of hairs are forced back into their hair follicles as your bully moves. Once a hair follicle gets plugged, sweat that should normally drain through the bottom of the foot stays in the foot and becomes infected. The infection then tries to rise to the top of the foot to escape and often spreads to surrounding hair follicles. What Are the Typical Symptoms of Interdigital Furunculosis? If your bulldog develops an interdigital cyst, you need to take him to the vet for treatment. The vet will most likely prescribe oral antibiotics or steroids, and he will inspect the cyst to check for a foreign object. If the cyst is caused by something simple like a splinter, your vet can remove it with tweezers. If the vet determines that your bully has demodectic mange that is causing interdigital furunculosis, he will prescribe mange treatment. In some cases, your vet may determine that surgery is the only way to treat your bully’s interdigital cyst. If that is his recommendation, ask your vet if he is instead willing to prescribe a foot soaking and cleaning protocol. Although healing a cyst with cleaning and soaking is a lot of work and can take 6 – 8 weeks, it is a much healthier option for your bully than foot surgery. Surgery to remove an interdigital cyst causes permanent changes to the confirmation of your bulldog’s foot. Recovery from foot surgery is lengthy, painful, and difficult. After foot surgery, your bully will be prone to more interdigital cysts, foot pad problems, and orthopedic issues. How Can I Protect My Bully from Interdigital Furunculosis? In order to protect your bulldog from interdigital cysts, you should help your bully maintain a healthy weight. Most importantly, you should make foot cleaning and inspection a regular part of your bully care routine. Any debris between your bully’s toes should be promptly removed and followed up by cleaning between the toes. As with all foot problems, you should seek vet attention at the first sign of trouble. Remember that surgery may seem like a quick fix, but it could cause long-term suffering for your bulldog. Treating foot problems in your bully requires diligence and patience, but educating yourself regarding the foot health of bulldogs will help you and your bully stay on your feet for years!